Hot Sellers and Fan Favorites from the ARA Rental Show 2016! Granite Industries would like to say thank you to everyone that stopped by our booth. We continued to hear excellent feedback on our products, especially our heavy duty hand trucks! The show would not be possible without your support and feedback. The Granite booth was a happening place with new and updated products! Be sure to check out our online store. Shop online anytime. The Granite PowerTrak 750 & 1100 are brand new for 2016! These heavy duty carts are built on a chassis that utilizes rubber tracks for maximum traction. The 7 HP Command PRO Kohler gas motor provides ample power and carrying capacity. The PowerTrak can tackle inclines, declines and muddy terrain with ease. The Brentwood buckets improve usability and provide long term durability. We received plenty of positive feedback on this cart and look forward to many happy rental shops featuring the contractor-ready PowerTrak! The Power Snappy was a huge hit at the 2016 Rental Show! The Power Snappy is built from the ground up in Archbold, OH from top quality components. The patented all electric drive system features two independent hub motors and a powerful 35 Amp-Hr battery pack. This allows the unit to be used for up to a week on a jobsite without a recharge. There was plenty of amazement from customers at the simplicity and functionality of the motorized scaffold. It fits a key gap for many rental companies between manual utility scaffold and 2-ton scissor lifts. It can be carried by two men, fit in an elevator and in the back of a pick-up truck. The XT is an American Cart exclusive product. Developed from the standard Multi Mover, this cart is bigger and offers an increased capacity when compared to it’s little brother. 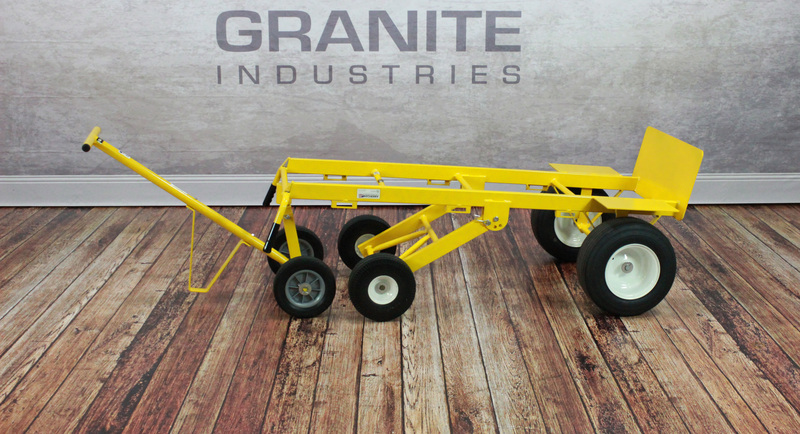 When discussing this cart with customers at the show, the versatility was the most appealing feature. The folding plate is an extended size of 31″L x 27″W. This allows for maximum carrying capacity. Capable of moving up to 1,000 lbs and backed with a three year warranty, this cart is ready for heavy use. The Mega Hauler was very popular as well, especially with the trailer dolly attachment. We spent a good amount of time developing this stage so it would solve three common problems rental companies have with aluminum staging. 2. They use too many legs – SOLVED – Our AXIS 2.0 Deck works using a 4-2-1 leg system. The allows the decks to “hang” off of each other reducing legs and setup time. 3. There are too many loose parts – SOLVED – Our AXIS 2.0 stage is very simple to setup. Attach the leg via a built in hand tightener and connect the decks via a roto lock. The X-Country Wagon received plenty of interest and continues to be one of the best value carts at the show. The cart comes complete with a welded frame and massive 13″ flat free tires. The side posts are also removable creating a versatile cart for hauling almost anything. The show special of $415 sealed the deal on many orders at the show. to accommodate much more than that. The most feature was the chair pallet accessory. This allows the easy stacking of up to 50 chairs. The chair pallets have casters so they can be used to store chairs when they are not being transported. The 34″ forks are 15″ apart and allow for maximum versatility around the shop. Featuring no flat tires and a capacity of 750 pounds, this cart is ready to go at anytime and with any load. Year after year this continues to be one of the most popular items at the ARA show. Capable of holding folding chairs, banquet tables and 5 foot round tables, this solves the ever common “storage” problem. The table cart can be stacked up to three high, allowing for maximum floor space efficiency. The cart features fork truck lifting brackets for easy moving. The 1,500 pound capacity speaks to the excellent build quality. The e-strap system was the final feature that really interested customers. Strap in the load from 6 different points. In the wake of a great 2016 show, Granite is still committed to excellence from engineering to final assembly. We stand behind our products and are continually innovating to bring you the best product and value. We look forward to seeing you again in 2017.